We propose you an article about the fixed star Algenib and its astrological meaning. Algenib is a blue-white star in the constellation of Pegasus. 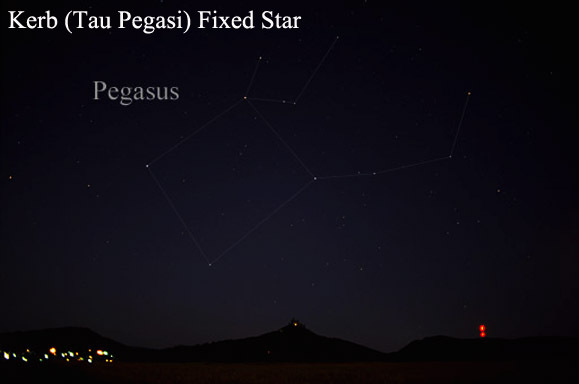 The constellation bears the name of the winged horse Pegasus from the Greek mythology. This is a large star with almost nine times the mass of the Sun and close to five times the Sun’s radius. 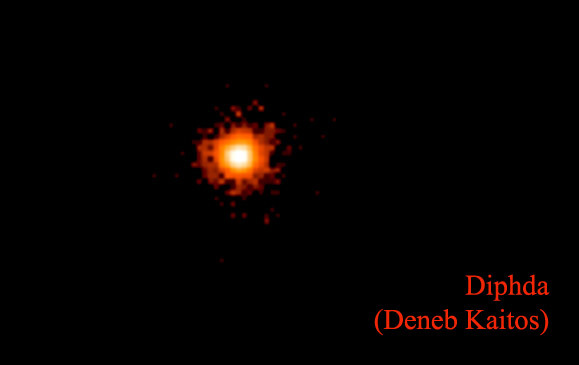 Algenib or Gamma Pegasi has a total luminosity of 5,840 times that of the Sun. its outer atmosphere has an effective temperature of more than 21,000 K. At this temperature, the star glows with a blue-white hue. We find this star at 09º 09’ Aries (in 2000). The Sun joins Algenib on March 29 each year. Over time, this star bore the traditional name of Algenib. This name derives from the Arabic Al Janb, which means the Side. Until 2016, this name was also used for another star, Alpha Persei. Since then, Alpha Persei was given the name Mirfak. 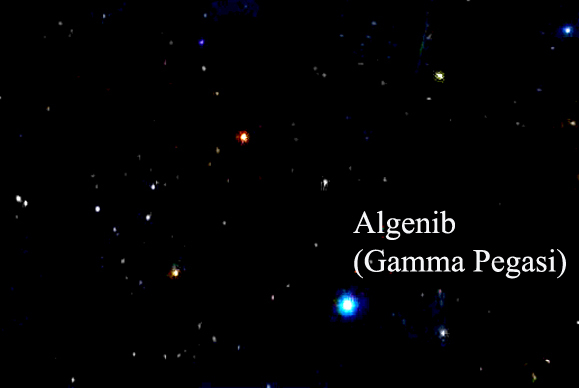 So, Algenib remains the name only for this star, officially known as Gamma Pegasi. Chinese astrologers called this star Bixiu yi, meaning the First Star of Wall. According to the Chinese astronomy, it is a part of an asterism called Bixiu or the Wall. Hindu astronomers called Uttara Bhādrapadā or Uttṛṭṭāti the asterism of Gamma Pegasi and Alfa Andromedae. Algenib or Gamma Pegasi was situated, in 2000, at 09º 09’ Aries. One hundred years before, in 1900, his position was 07º 46’ Aries. In 2050, Algenib will be perceived at 09º 51’ Aries. Traditionally, astrologers considered it an unfortunate star. The English astrologer Vivian E. Robson wrote that Algenib is of the nature of Mars and Mercury. According to him, it gives notoriety, dishonour, violence, misfortune and denotes the naked and poor professional beggar. The German astrologer Elsbeth Ebertin wrote about its aspects with different planets and luminaries. According to her, in conjunction with the Sun, it will make for a fighting spirit and a love of learning. Connected with Mercury, Venus and Jupiter, one can count popularity and interest in art and literature and distinction. With Saturn, in general, it is thought of as an impeding factor. If angular with Mercury and Uranus, Algenib will make for an inventive spirit. Other astrologers have less optimistically interpretations. Thus, they say that aspects with Sun bring mental disturbances, fevers, ill health and some danger of accidents. Moon conjunct Algenib can bring dishonour, loss by scandal, exiled or forced to flee, ill health, trouble through writings. In astrology, usually we study the influence of luminaries – the Sun and the Moon –, of personal, social and transpersonal planets (like Mercury, Jupiter or Uranus). We also study some asteroids (like Chiron or Juno). Of course, everything in universe constantly moves. So, the fixed stars aren’t really fixed. Actually, their position moves by 50.2 seconds of arc per year, which means one degree every 72 years. A fixed star needs to be within one degree and in conjunction to one of your personal planets to have impact. Algenib, for example, have impact when our Sun or a natal planet transits 09º 09’ Aries. Share the post "Algenib or Gamma Pegasi – Fixed Stars in Astrology"